The first time I tried tofu my friend baked a block for me, slathered in BBQ sauce and called it dinner. I’m a champ so I stomached it, but I pretty much vowed to never eat the stuff again. Obviously, my opinions have since changed. I would consider myself a quiche fan, but certainly not an aficionado. But I wanted to give a tofu version a try. After mastering tofu in stir fries, peanut sauce, and spring rolls, a quiche seemed like the next step in my tofu journey. And I’m happy to report my experiment was a success; you could say I’m a total tofu quiche convert (it’s what all the hipsters are doing). This quiche is simple! So even if you’ve never attempted a quiche before, I have faith that you can nail this version. It requires just 10 ingredients and simple methods even the novice cook can master. For starters, the crust is just hash browns (making the whole thing naturally gluten-free)! And the filling is loaded with roasted veggies (any you have on hand), and a mixture of silken tofu, hummus and nutritional yeast to give it that perfect “egg-like” flavor and texture. 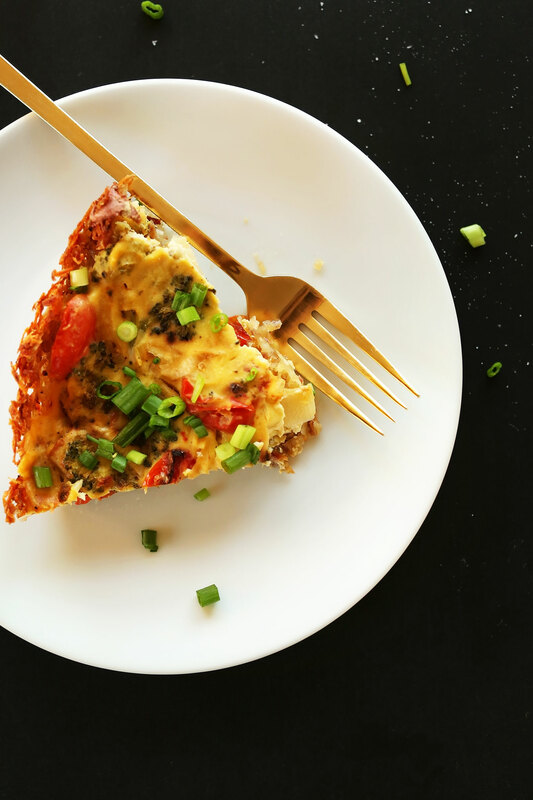 I think this quiche would be lovely for brunches and lazy weekend mornings, as well as when you have family in town for the holidays. I’m confident vegans and non-vegans alike would totally dig this quiche. If you give this recipe a try, let us know! Leave a comment and rate it, or take a picture and tag it #minimalistbaker on Instagram. We’d love to see what you come up with. Cheers, friends! The simplest tofu quiche on the block with just 10 basic ingredients and no fancy methods required. A hash brown crust keeps this dish gluten-free as well as vegan! Perfect for lunch, brunch, and even brinner. Preheat oven to 450 degrees F (232 C) and lightly spritz a 9.5-inch pie pan (as original recipe is written // adjust if altering batch size) with non-stick spray. Grate potatoes and measure out 3 cups (amount as original recipe is written // adjust if altering batch size). Then transfer to a clean towel and firmly squeeze out excess moisture. Add to pie dish and drizzle with melted vegan butter and 1/4 tsp each salt and pepper (amount as original recipe is written // adjust if altering batch size). Toss to coat, then use fingers to press into the pan and up the sides to form an even layer. Bake for 25-30 minutes or until golden brown all over. Set aside. When you take out the crust, lower oven heat to 400 degrees F (209 C). 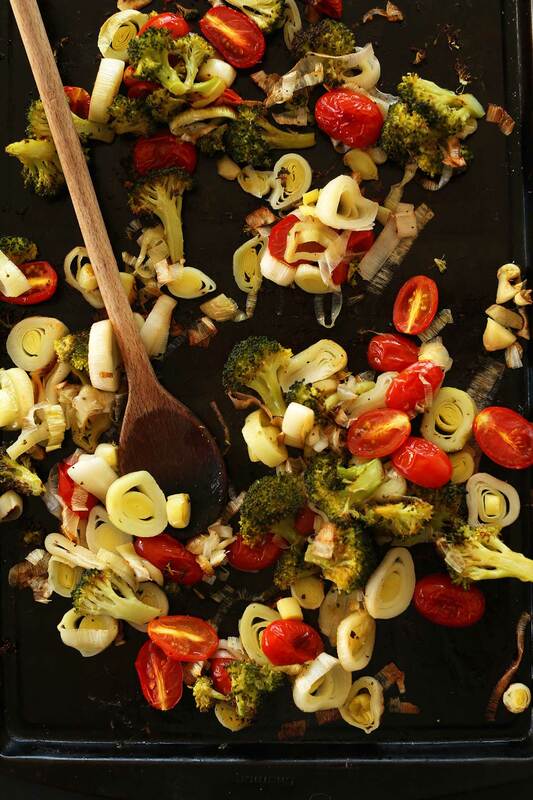 Prep veggies and garlic and add to a baking sheet. Toss with 2 Tbsp olive oil and a healthy pinch each salt and pepper and toss to coat (amounts as original recipe is written // adjust if altering batch size). Place in the oven and bake until soft and golden brown (a total of 20-30 minutes). Set aside and lower oven heat to 375 degrees F (190 C). 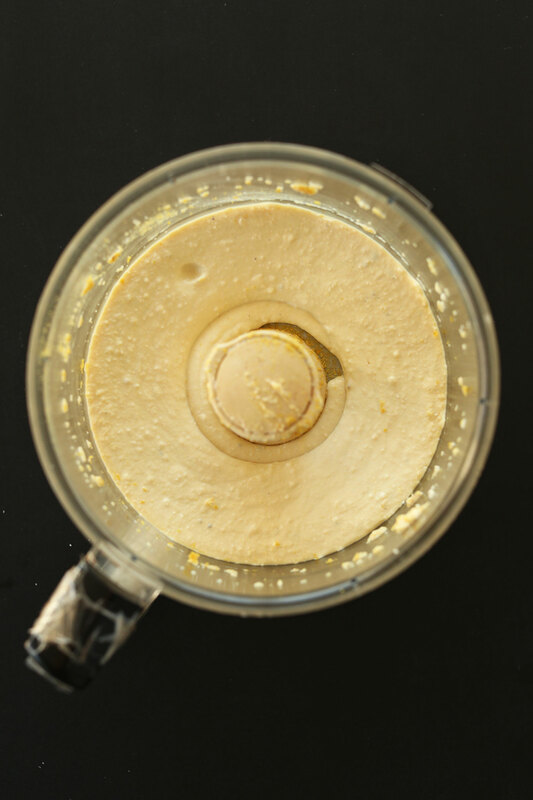 To prepare tofu filling, add drained tofu to a food processor with nutritional yeast, hummus, and a heaping 1/4 tsp each sea salt and black pepper (amount as original recipe is written // adjust if altering batch size). Set aside. Bake quiche at 375 degrees F (190 C) for a total of 30–40 minutes or until the top appears golden brown and firm. If the crust begins to get too brown, loosely tent the edges with foil. Let cool briefly, and then serve with fresh herbs or green onion. Store leftovers loosely covered in the fridge for up to two days. Reheat in the microwave or in a 350-degree F (176 C) oven. I have made this twice now. The first time I used a gluten free pie crust, but otherwise followed the recipe exactly. It was good, but my daughter said that it tasted like hummus. The second time I used Cascadian Farms root vegetable hash as the base and just added a 1/4 cup of chickpeas and some dijion mustard instead of the hummus. I turned out nice and we liked it better with the different crust. What consistency should the filling be when it comes out of the food processor? I plan to use my vitamix and I’m not sure how long and at what speed I should process it. Hi Laura, the mixture should be like a thick custard. Hope that helps! What a wonderful recipe, thanks so much! What, if anything, would make this freezer friendly? I had to omit the hummus as I hadn’t made any so out of pure desperation I had some aquafaba in the fridge so added that instead. Worked wonderfully. It was a dryer mixture than yours looked but not dry result by any means. I had also added about 1/3 cup sun dried tomato in oil so maybe that helped! The potato base is amazing, what a treat. Hmm, we aren’t sure! We think the tofu and tomatoes would make it too watery when removed from the freezer. Perhaps swapping the tomatoes with something less watery would help, but we can’t guarantee it will work! If you give it a try, let us know how it goes! Thank you for the recipe! I made this recipe for a food science experiment! I made this insanely flavorful quiche today. My husband loved it so much, he ran out to get more ingredients for me to make more. I made three of these quiches today. We keep going back for another sliver. Taking one tomorrow to my in-laws with the confidence that it better than any “real” quiche I’ve ever had. Can’t thank you enough for your blog. Your recipes are game changers for two newly converted vegans. I made this today and after trying several Vegan quiche recipes which used Chicpea flour and found them very dry. You recipe was the most like the soft, creamy eggy texture of traditional quiche and hubby and I really loved it! I doubled the filling though as I had a large pie dish and I used store brought vegan pastry which I blind baked first. I used a mixtue of vegies leek, broccoli and mushroom and seasoned well with vegan parmesan. I also put some garlic powder into the “egg batter” along with the nutritional yeast and a big tablespoon of chickpea flour to give lightness and help bind it. I think this would also be lovely with little tomatoes halved and some vegan fetta. Well done on a great recipe. It made cooking (and eating) a joy! Thank you; this is helpful, as I’m looking to make this for a baby shower this weekend. This was amazing!! WOW! Your recipes are consistently my favorite! Out of laziness, I used frozen shredded hash bwowns. I replaced the tomatoes with 1/2 a zuccinni and a handful of chopped mushrooms. I pressed the tofu too (habit). Perfection. Leftovers the next day made my mouth happy. Prep time was long but worth it. This was delicious. I made it on Christmas Eve for Christmas breakfast and it reheated great in the morning. I made a few alterations to decrease prep time: I used frozen shredded potatoes and I cooked the crust in the toaster oven at the same time the veggies were roasting in the oven so everything came together about 30 minutes faster. Thanks for the delicious recipe! Great! Thanks for sharing, Shawn! Is the tofu an extra-firm block or a silken (as soft) half pint ? An extra-firm silken half pint! Hi Chelsea, we haven’t tried it, but we think that would work! Other readers have mentioned successfully using various types of tofu. Hope that helps! This vegan quiche tastes so, so, so good. My fridge was running extra low on veggies so I only added sauteed onion and garlic to the tofu mix, but kept the rest as is. However, my potato crust didn’t crisp up. It got super brown and deliciously crunchy on the edges but beneath it stayed soggy, even though I blind baked it for an extra 15-20 mins more than the recipe states. I think next time I might grate the potatoes ahead of time, salt them, and let them drain in a colander for an hour to help remove extra moisture. Any other ideas?? Okay I want to make this….. but I’m terrified of tofu! Can anyone tell me…….. does this actually taste like tofu? Alex J – I’m not a huge fan of tofu, but you won’t know you are eating tofu when you follow this recipe. Give it a go! I made this today, but am not a fan of potatoes, so made up a ‘crust’ by cooking up 1/2 cup of quinoa and mixing it with 1/2 cup oats, a small handful each of sunflower and pumpkins seeds, chia seeds and hemp seeds. Added 1 tblspn of coconut oil, a tablespoon of flax seed (powdered) seasoning and water to bind. Baked this blind for about 20 minutes. Followed the filling recipe except I replaced broccoli with asparagus but next time, I wouldn’t pre-cook it – think it would cook in the filling adequately enough. Thank you – it was delicious! Great recipe! I made mine without vegan butter and used diced potatoes because they were what I had. I also used only broccoli because I didn’t have any leeks. I added black salt, turmeric and ground mustard and a good half cup of pico de gallo. This is definitely a very versatile recipe and great tasting. Thank you for the inspiration. Whoop! Thanks for sharing your recipe changes, Kari! While you can make it without oil, it should crisp up somewhat without it but it definitely won’t be as crispy! Thank you for your quick response. I’ll let you know how it turns out. This recipe is so damn good! I much preferred the crispy hashy b base to the all-too-often soggy pastry. My non-vegan aunts were initially very skeptical towards the idea of an egg and cheeseless quiche but ended up absolutely loving it. Thanks for the recipe. Will definitely make again! Yay! We are so glad you enjoyed this recipe, Tom! I love tofu but am always weary of new recipes as the texture can sometimes be off putting but this was delicious! The crust was crunchy and the filling so similar to egg. Even my non vegan, tofu hating partner tried it and went back for seconds!! It was great my only dislike was the base, maybe I made the base to thick because it was still all soft and discolored by the end of it. I’d also reccomend adding as much veggies as possible (broccoli is bomb) and adding vegan cheese to the mixture. Kids ate it as if they hadn’t eaten in weeks lol it was a hit. SO SO happy I found this recipe!! My boyfriend who is not a vegan and “doesn’t like quiche” came back for seconds!!! I was in a real pinch so I did make some modifications to this recipe because I just used what I had on hand. I used silken firm tofu instead of extra firm, Sabra pine nut hummus, and Simply Potatoes o’brien style hash browns. Veggies I had on hand were broccoli, mushrooms, and an onion (instead of roasting the mushrooms I sautéed in vegan butter with minced garlic). With the store bought ingredients this recipe was SO easy and still delicious!! I definitely want to try again and stay true to this recipe, but either way we will be making this one again! Made this for the first time tonight and turned out well! I only had firm tofu and no problem at all after blending in the vitamix. For the potatoes, I rinsed them in cold water twice and dried thoroughly and the crust turned out perfectly! Served it with your spicy tempeh sausage for a breakfast for dinner thing. This is delicious. I’ve just made it. I was very apprehensive as I hate tofu but the positive comments made me try it. I changed the potato base and made a pastry crust with oil instead of vegan butter. It was light and crispy and amazing. I just updated that! Bake the crust until golden brown first then set aside. Then bake veggies and set aside. Then add the veggies to the filling and add the filling to the crust and bake all together at the end. Hope that helps! This was so yummy, can’t wait to make it again and mix up the veggies :) Thank you so much! Wowza! This was so good. Just the smell of it cooking rounded everyone to the table early! I substituted shredded frozen potatoes. Used the onion instead of the leek and mixed with spinach before cooking. Also I doubled the recipe and used two small casserole dishes adding time to it cooking since it was thicker than a pie pan. And do to the store being out of silken tofu (must be a good change happening out there) I used one package silken that I had on hand and one package of firm, came out so so good. I was worried about the small changes but man is plant based cooking the way to go. Sooo yummy! Thank you! Yay! We are glad you enjoyed it! I love this recipe! Planning to bring it to Father’s Day brunch this weekend. I’m not a fan of grating potatoes so I use the shredded hasbrowns from Trader Joe’s and it works out perfectly. Great recipe. The whole family loved it. Nice and easy for a weeknight. We served it with a roquette salad (roquette, olive oil, aged balsamic, lemon juice and vegan parmesan). This is my go-to quiche recipe! I add a bit extra nutritional yeast and broccoli (my favorite veggie) and use onions instead of leek (only because onions are on hand). My husband and I so appreciate all of your simple, delicious, plant based recipes. Big thanks from Calgary! It is flaky, fresh, and really tasty. Don’t skimp on the seasoning. Yum. Thanks for sharing your changes! I made this for the first time yesterday…in the words of my husband “it was slamming!”…thank you for sharing this recipe. I will be making again for sure. Delicious! Tastes nothing like quiche in my opinion, but it’s still a keeper! Scratch that, this definitely tastes like quiche, if you let it cool before you start wolfing it down. I accidentally Added an extra 100g of the tofu. Will this still bake ok??? Oh my goodness, so delicious, never before made, but I will be making this again! Lots of tasty homegrown veggies with crispy potatoes AND CHEESE . Thank You for sharing your masterpiece! We’re glad you enjoyed, Deb! Hi, I’m prepping for Easter tomorrow. I’m going to make the crust, roast the veggies and process the tofu mixture today. question: Should I leave these separate until tomorrow or mix together and let sit in fridge until tomorrow? I want to bake it once I get to in laws rather than reheat, but would like it as close to ready as possible. Hi Corinna! Getting to this question a bit late, but you can either assemble it all ahead of time or bake it, and then reheat at 350 degrees the next day. Hope this helps! Hey- So I LOVE the idea of the hash brown crust, but unfortunately one of my family members has a potato allergy. Is there anything we could sub the potatoes with? She is able to have sweet potatoes. Each holiday we make at least one or two of your recipes and they’re always big hits! I can’t wait to try this one! Thanks in advance!! Hi! Although I’ve been following you for about one year and I just found this recipe. I can’t nutritional yeast so should I substitute it with something else or just leave it out? Hi Stacy! Not necessarily, but it does inject a lot of flavor. If you try it without, let us know how it goes! Wow! The hashbrowns really make this recipe. I added wood ear mushrooms, liquid smoke and tamari to give it a little bacon flavor and it rocks. My question is in making the tofu mix a bit fluffier. I’ve used almond milk with lemon in it to fluff pancakes better… I wonder if a little of this would help? Thanks for taking the time to go back and rate it, Dave! It means a lot to us! Hi Dave! We have not tried it, but I think that could work to make them fluffier! If you give it a try, report back on how it goes! My store doesnt sell Extra-Firm silken tofu. Is regular Extra-Firm ok? We haven’t tried making it with regular extra-firm but would recommend silken if you manage to find it! Not sure! Let me know if you try it. Excellent recipe. I used a premixed seasoning and the outcome was delicious. My non vegan work friends loved it! This isnoeymy go to quiche recipe. And it’s easy to make! – I sprayed the pan with coconut oil. – My “hummus” was chickpeas, lemon juice, water, and garlic. – Also, I added rosemary and thyme to the potatoes and it was amazing! Have made this a few times and refined to our taste: I use closer to 4 cups of potatoes (use frozen shredded hashbrowns to save time and mess). I skip the cherry tomatoes- they introduce a lot of moisture which made it difficult for me to get the firm texture we like. I add a few pinches of turmeric to get an ‘eggy’ color, and this time I made the tofu filling ahead of time and refrigerated; somehow, this made the flavor even better (plus made for much faster prep for brunch on Christmas morning). Mix roasted veggies into tofu mixture and pour into crust just before baking. We bake at least 40 minutes but probably closer to 45 or 50 to get firm consistency. This is absolutely delicious! I’m from Australia and I have recently become OBSESSED with ALL of your recipes!! I am currently in the middle of you 31 day meal plan and I am loving it! I just had a quick question about the tofu quiche. Would it be possible to freeze the left overs? And if so, how long would they last in the freezer? Hi! We haven’t tried it but if you do, let us know how it goes! Made this tonight! So amazing! As expected coming from minimalist baker! Added extra nutritional yeast, and toasted pine nuts to mine. Incredibly moorish and never nutritious ! So easy too!! 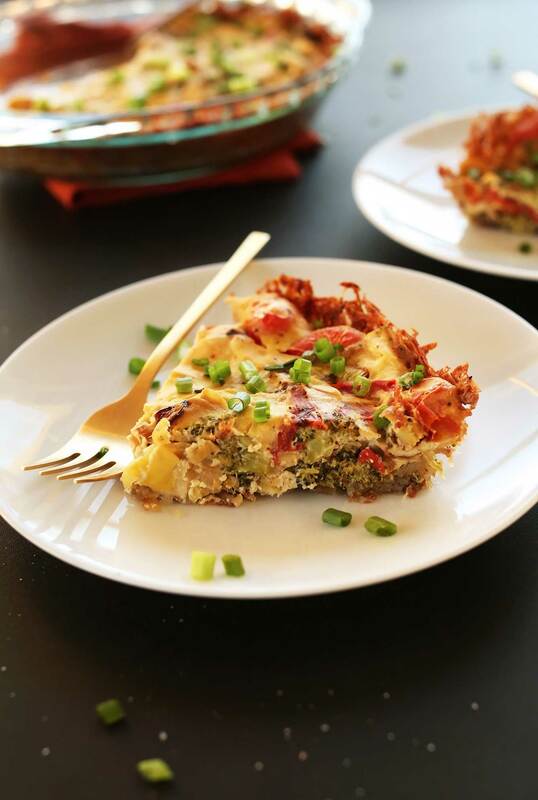 Recommend this recipe to anyone missing their quiche after transitioning to vegan. I made this for a brunch I hosted were I knew I would be the only vegan. I also ordered a bunch of regular meat and veggie quiches from Marie Callendars. This quiche got eatten faster and got more compliments than any of the ones I bought! Tons of people asked me for the recipe and were surprised it was vegan. Even my 6 year daughter asked if I would make it more often. Total winner! Amazing…. first time using nutritional yeast, and I thought it was great. It added that cheesy flavor the quiche needed. I have enjoyed each of your recipes that I have made, as does my 3 yro, and my husband. Just made this with sweet potato hash crust! Didn’t have hummus so I added 2 tbs of miso paste. So good! I used tossed kale and onions as my veggies and topped it with Kite Hill yogurt. This was delicious! It isn’t complicated but does require a bit of a time investment. Totally worth it! What a great recipe! I followed it as written except I’m one of those no oil vegans. I did spritz the pans but that was it and it still turned out incredible. It comes together so fast. I returned from the gym, put it together and by the time my dh returned from his run and had showered, a gourmet breakfast was ready! I served it with sourdough biscuits and fresh fruit topped with chopped mint. Another winner! Thank you! Hello! I am also one of those vegans. =D Just to clarify, you just tossed the potato in salt and pepper and pressed it together no problem? Yes. I think that is all I did! I do! Maybe just dice some potatoes in the bottom for a faux crust! This was SO good! I didn’t have hummus or nutritional yeast but I added Vegan Pepperjack cheese pieces into the mix (not blended in, just mixed in) and it was so good, I also don’t have a cheese grater so I used sweet potato slices for the crust, just layered them up! I was surprised how much I liked the texture and I’m definitely not as wary of tofu as I was previously. This quiche was delicious! Tasted just like real quiche. Eggy and cheesy, loved the potato crust too…will make again! Will be trying recipe for sure! Any alternatives to hummus in the filling? Also would like to make it oil free/ butter free. Any suggestions? Hi Vinita! It should crisp up somewhat without the oil, but it definitely won’t be as crispy! As for the hummus, just leave it out and add more silken tofu! Hope this helps! Hey Dana, why only two days in the fridge? I’d love to make this on Monday and enjoy for the rest of the week! Thanks in advance! Hi Alexis! After a couple days, the crust becomes soggy and is not as great as when fresh. Hope this helps! Good luck not eating it all in one sitting after you tastes how good it is! I was planning to save some but nope, ate it all lol! This turned out delicious. It does take some time to prep and cook, but it was worth it. I followed the recipe exactly, but I might experiment next time with mushrooms, peppers, spinach- I think the base recipe would work great with all kinds of veggie combos. Since this takes a while to make and we have busy lives, I might try to double next time and freeze one. This looks gorgeous! I want to make these as mini quiches for my baby shower! Would I have to alter the cooking time if I used a muffin tin instead? Thank you! Did you end up trying it? I want to make them in a muffin tin as well and am wondering about your results. There are so many vegan quiche recipes out there now. But when I saw that Minimalist Baker’s was at the top of the search, I was done. I have loved every single thing I have made from your recipes. Thank you Dana! This was absolutely amazing. I made the quiche filling the night before and cooked it christmas morning. I used a store bought vegan pie crust instead of the potato crust to save time and make it more of a traditional quiche for my carnivore family. I used regular tofu (instead of silken) and it worked just fine. I also used mushroom instead of tomatoes, and went for the onions too. I don’t think my grandparents even knew that there were no eggs in it. My dad was a big fan, as was I. I will definitely be making this again and will have to try it with the potato crust. I just made this with soft tofu and it turned out GREAT! Thank you! I am not familiar with cooking with tofu and am new to veganism. Can I use regular tofu or does it have to be silken? I think you can use regular! I haven’t tested it myself, but have heard that it’s possible. Let me know if you give it a go! I have made this recipe several times and it has always turned awesome. Just wanted to say thanks for putting this recipe together and sharing. It has tantalized our taste beds every time! This was an easy recipe to follow and so delicious! My boyfriend and I polished the while thing off enthusiastically. :) I used a red bell pepper instead of tomatoes, since that’s what I had on hand. That’s all I did differently. Super, I will definitely make this again! I made this and my husband and I really liked it. I did not have leeks or tomatoes, so I subbed in the onion and also a handful of chopped sundries tomatoes (from a jar packed in oil). It worked well. Next time I would love to try the leeks and tomatoes and probably would not cook it quite as long as I did. I think I worried too much about the firm top and the crust being entirely golden brown. This recipe is absolutely delicious!! Thank you for sharing!! I actually had made some vegan “feta cheese” (see here: http://greenevi.com/vegan-tofu-feta-cheese-new-and-improved/), and crumbled it on top of the quiche before putting it in the oven- turned out really great! Also, I had some canned jackfruit on hand (which shreds kinda like chicken), so I added that to the roasted veggie mixture. Really pleased with the recipe! Ooops sorry for the repeated question! Oh my goodness this is going to be my main activity this Saturday – looks delightful! Do you think this would freeze well? Thank you for all the amazing recipes you share with us! We haven’t tried it but if you do, let us know how it goes! Any update on the freezing? I have not tried this yet but would probably alter a few things: par cook ANY potato in the microwave – this tip follows for any potatoe pancake recipe as well. Use a cast iron skillet and heat it up before pressing in potatoe mixture (careful with hot pan). 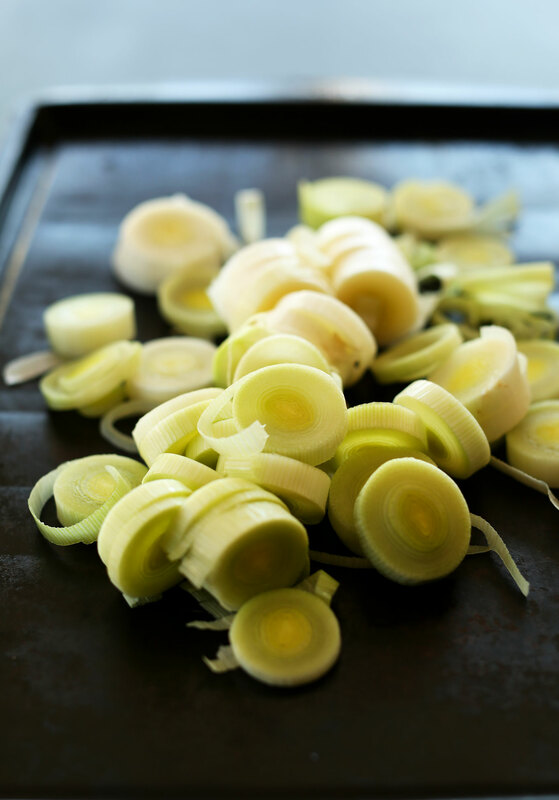 And forget roasting the veggies here – quicker to sauté before adding to crust. This is delicious. Made it tonite and I am surprised how good it is. I don’t eat a lot of tofu but I will definitely make this again!! Just made this quiche and I am so happy with the results! I added mushrooms but followed everything else exactly and it’s delicious :)! Your recipes are amazing. Anxious to try this!! Could I swap out the regular potatoes for sweet potatoes? Do you reckon this would freeze? Great recipe though, I’m excited to try it! Did you try freezing it? Just made this! I’m typing as I’m eating and oh my goodness it is delicious!! Love your recipes, thank you! I have made this recipe twice now. I think it is amazing! I followed the recipe exactly, with a tiny addition, half broccoli and half asparagus. My neighbor loved it as did my guests at a wedding shower I hosted. The flavors are really nice. I will make it again and I have told so many friends about it. This is a winner for sure! This was edible, but I did not care for the flavors too much. My hashbrown crust got too crispy on the outside and too soggy closer to the quiche. The veggie combination was a bit bitter for me. I was hoping for a more cheesy flavor. One of very few misses on your blog nonetheless. This is a great dish and not at all hard to make. I didn’t have silken tofu on hand, so made this with regular firm tofu with the liquid added, plus about a tablespoon of the liquid from a can of white beans (it sounds weird, but it works). I blended with ferocity and the texture came out beautifully. I also added a teaspoon of mustard (dijon) and some smoked salt to the tofu blend to encourage ‘egginess’. I’ve heard smoked paprika is good for faking savory egg mixtures as well. When you say you made it with extra firm block tofu with “the liquid added” do you mean the water that the tofu soaks in, or was there a different liquid combination suggested? I didn’t read the recipe close enough and ignored the “silken” part. I adore this recipe. My boyfriend and I were pretty doubtful on first attempt, and were discussing what we would have instead (when it came out and we didn’t like it). But alas, this meal blew our minds, and now, I make it for all of my non-vegan friends. Everyone loves it. Anyhow, I continue to have trouble with the crust not getting crispy, and the edges seem to always burn (which is OK, still tastes amazing). Should I try to dehydrate the tots a bit before cooking? Any tips? Just discovered you on IG? 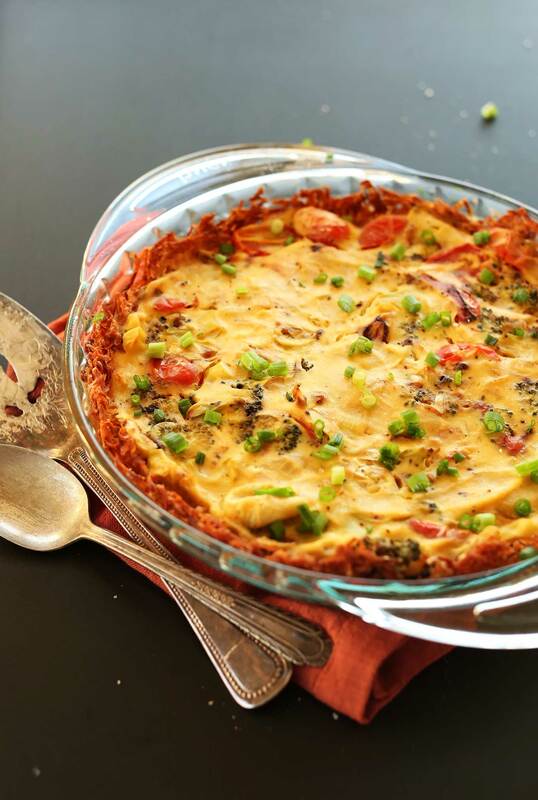 This quiche is an amazing dish! I added vegan sausage and cheese….perfection?? I am little confused (not native speaker). First you bake a crust, then you put it out of the oven, prepare vegetable. Then you put vegetable and crust to the oven separately. Until the crust is baked and after that you will move vegetable into crust and bake it. At the end you add tofu, etc. Or you bake a crust, and meantime prepare vegetable. Put vegetable onto crust and bake it together. And at the end you add tofu etc. Did we all just have terrible experiences with Tofu and something to drown it in? My sauce of choice was sweet chilli. It wasn’t horrid, but it wasn’t great. I havnt eaten tofu since…until now. I just made this recipe and I love how it tastes! Unknowingly, I used a finer grater than I probably should have for the potatoes. The crust turned out more like a doughy crust than a hashbrown crust, but it was very good. The only reason it did not get a 5 was because it took me much longer than 15 minutes. I would say an hour and a half just to prepare it. But overall, it is a good recipe. I made this tonight and I didn’t follow the directions and It turned out to be more of a tofu scramble with hashbbrowns. It was really watery and the hashbbrowns weren’t brown as yours. Still good! I added rosemary, mushrooms and spinach. Do I have to use the nutritional yeast? I’m not a huge fan of it. Not necessarily, but it does inject a lot of flavor. I don’t think it makes this cheesy, it just adds overall flavor. But if you try it without, let me know how it goes! This was so yummy and was part of a great brunch! Thanks for all your wonderful recipes! Scrumptious! I made mini ones in a muffin tin lined with lazy ready made (vegan) pastry. I sautéed onion and just used sweetcorn with piri piri hummus. Very tasty. Not sure about the potato crust as mine just went soggy – could have been brand of the vegan butter I used. However the filling was really delicious and I am making it again today with a vegan pastry crust to try out. Thank you for that information, as I also must use organic tofu. I’ve been following the site for years and love all the innovative vegan/vegetarian recipes you’ve posted! I made this a couple months back and LOVED it, and now I’m making it again for my mom next week. Takes a while to make, but totally worth the wait. I’ve never had quiche before (been somewhat vegan since childhood) but I assume this is close, if not much better! Thanks so much for sharing. I JUST made this for my husband and I and it was THE most amazing dish I have had so far since we stopped eating animal products. I have to make about six of these at a time, though–they’re THAT good! I have a video podcast where I have a small segment where I talk about vegan cooking/food and I will definitely link this recipe in my podcast! I’m off to have the last quarter of the quiche. This tastes so good. Thank you for creating this recipe! I substituted garlic/leeks with sweet peppers and tasted wonderful. I am about to make this quiche, but this is confusing: “Place [veggies, in baking pan, I think] in the 450 degree oven with the crust. When you take out the crust, lower heat to 400 and continue baking until soft and golden brown (a total of 20-30 minutes).” The previous instructions say to put the vegetables in the oven next to the quiche. So when DO I take the quiche out? And when I take the quiche out, what continues baking? it must be the veggies, but it’s leeks and tomatoes and broccoli, so will they really turn soft and golden brown? Hi! I am confused by these instructions too. Did you figure it out? I make it all the time, my newly-vegan husband loves it, my vegetarian and omnivorous extended family loves it. I added kala namak one time, but honestly it doesn’t even need it (who misses sulfur anyway?). I’m making it this morning for Christmas brunch with family. Since I don’t have leeks or cherry tomatoes, I am going to make two different quiches and experiment with fillings, including soy chorizo! Thank you so much for sharing this recipe – it is brilliant and so simple! Yum!! Could I use normal extra firm tofu in place of silken tofu? That’s all I have at the moment so if that’s possible I’d love to make or for Christmas breakfast!! Did you end up using extra firm tofu? Do you think this would be okay to freeze for a few days? Would be a lovely addition to Boxing Day dinner but I’m trying to make as much as possible on the days beforehand! Hmm, I’m not sure. I haven’t tried that! But if you do, let me know how it goes! Going to make the recipe as mini quiches in muffin pans. I have guests arriving for Christmas after a very long international flight from the US (I am in South Africa) so this is going to be part of brunch! I am a bit of an unadventurous vegan – I love eating adventurous food, but I when I cook for myself, I tend to just make the same old boring staples. The other day I was at a party and the omnis were all eating delicious-looking quiches. It made me remember how much I used to love quiche. 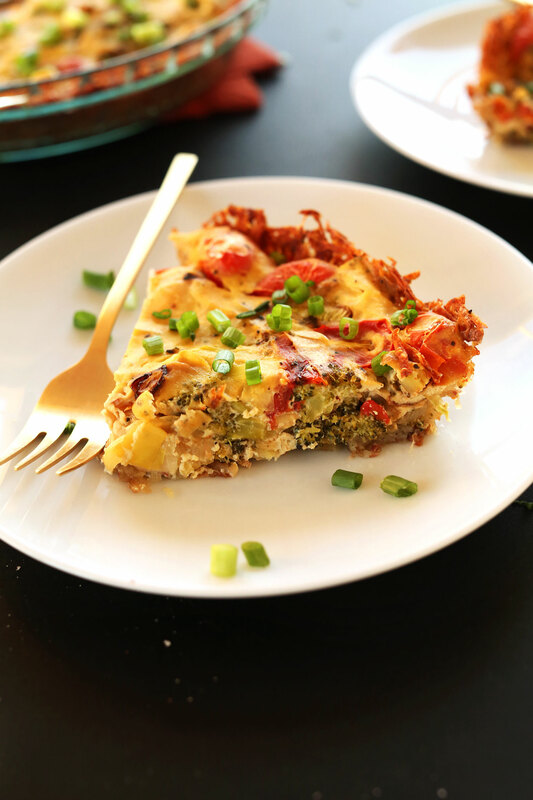 I Googled ‘vegan quiche’, and came across your recipe (I have, of course, been to this fabulous blog before though!!) When I read how easy it would be, how healthy it is and how stellar the comments/reviews were… I made a decision to snap out of my quotidian banality, try something new and cook it the following day. I followed your recipe (I made two tiny additions – a dash of dijon mustard and some kala namak/black salt – to really exaggerate the cheesy/eggy flavour) and I have to say this is one of the best dishes I have ever cooked – it tastes exquisite and looks beautiful. I can’t believe how delicious the filling is. You are truly a culinary mastermind. I now feel so galvanised and inspired – I’m going to work my way through your recipes and start cooking exciting meals for myself!! Thank you so much. Okay, this was A-MAZING. We have been cooking everything off this website for almost a year now and were a bit hesitant to try the silken tofu (mostly because we didn’t know where the heck it was in the grocery store) but it turned out so great. Thank you! We love your recipes! Ah, thanks so much! This is a favorite of mine as well. Glad you enjoyed it! I was wondering if there was any suggestions on a substitute for the tofu… This recipe looks amazing, but I have a gluten, egg, and soy allergy so I am unable to use eggs AND tofu. Lol I wanted to incorporate sausage too ((I’m not vegan, just have to look for recipes I can add meat to with all the other issues)) but I’m afraid just removing the tofu won’t give me the creamy egg consistency this quiche gives. Thank you! Hi Vanessa! I know this is an old post and I hope you have found an answer! If not, try Follow Your Heart VeganEgg. LIFE CHANGING. I am not vegan either but have an egg allergy and a personal aversion to soy. I use this stuff for everything. I am not vegan but my niece and nephew are and I love to make things for them. I decided to make a pie crust instead of the potato crust. Instead of roasting the vegetables I sautéed asparagus, broccoli and green onions with the garlic but not the tomatoes. I added the sautéed vegetables and the uncooked tomatoes to the tofu mixture, spread it in the unbaked pie shell and left it for my nephew to bake. They have a convection oven so the pie crust cooked nicely. I was able to prep this in about 45 minutes with a homemade pie shell with my substitutions. My nephew will try a lot of things I make but will only eat seconds if he really likes it. He ate 3/4 of this dish for dinner. So it was a hit!!! Next time I think I will add sautéed mushrooms as well. Bravo and thanks for the great recipe. Any ideas or thoughts on a sauce to drizzle or add to it? Maybe a balsamic glaze? What about spices to add flavor and mask the tofu? Would sweet potatoes work for the crust? I am trying to cut carbs. I really love this recipe, I’ve made it several times now and gobbled up the whole thing every time. I do prefer a whole wheat crust, and add my own veggies like mushrooms and spinach. This worked well assembled the night before, and baked in the morning. And even better as leftovers! Thank you!! Hi! How did you assemble the night before since it sounds like you need to bake the crust and the veggies separately? Do you mean you did those steps and then assembled it and baked the whole thing the next day? I made it… it’s a keeper!! Made this at the weekend! Was a slight fail as my blender isn’t great and I had no nutritional yeast but i still enjoyed it! I’ve been vegan for almost 4 months and this is the first proper meal I’ve attempted to make. I’m really not good at cooking. Mine didn’t keep its shape! Should I keep it in the oven for longer? Yes. It is still in the oven after 40min. But it is getting there!!! I do! Let me know if you give it a try! Ok, I will try to see if it works. I will do a trial as I want to make them for Rosh Hashana dinner we have here soon. I have a crowd of about 20 something, so individual portions helps the pass me’s. Thanks! I was hoping to do these as muffins too. How did it work out? Hi! Did you adjust the bake time or temp at all? Excellent recipe! Love the hashbrown crust idea, will try it next time. I made it crustless in a muffin pan (or tin muffin cupcake liners to be exact). Turned out beautifully. Added some tumeric for health and to enhance the yellow egg-like color. My favorite fillings are onion, herbs, garlic and spinach/broccoli/mushroom/mushroom and spinach. Would love sundried tomatoes on top. In South Africa, in my family, we eat it as part of main meal of the day for special occassions. Never had it for breakfast before. :) Yummy any time of the day, even as cold leftovers. I just made this, it’s amazing! Thank you! It’s made considerably more than expected, just wondering if this it’s freezer friendly and if so, is there any specific process for defrosting? Worried about turning the hash potato base into a soggy mess! I made this today, and my husband and I loved it! I used red onions and spinach for the veggies and it was wonderful! The tofu had a nice “scrambled” egg feel to it. I think we will be making this type of quiche on a regular basis. I might even take it into work for our next potluck. Thanks! Just made this for my husband’s birthday breakfast. He loves his eggs but we recently went entirely plant based. He is not missing those eggs with this recipe. Oh yay! Glad to hear it, Erin! xo – Happy birthday to your guy! Great recipe! Was thinking of sauting the vegies but so glad I didn’t. They were awesome roasted. I threw in some red pepper I had too. Didn’t have hummus made up but had tahini and chick peas so added each as is. Both me and my husband love this one! It’s a keeper! Thank you for the recipe. I did it yesterday for the family. We are not vegan but i think it was a great option for a light meal. Your recipes are always so delicious and simple, I think they could turn the whole world vegan. Coming from a time-pressed working student, do you think it would be possible to use frozen hashbrowns? I am just trying to avoid grating those potatoes! So kind! Yes, I think you can use storebought hashbrowns. Best of luck! I just made this recipe yesterday for mother’s day brunch for all omnivores except for me! It was a hit. I had never tried quiche before (vegan or not) and totally loved how it turned out. I used pre-made frozen hashbrowns, which worked well(yay lazy!). I have been vegan for 15 years and am in love with how easy and delicious your recipes are!! THANK YOU. Wonderful! Thanks for sharing Nadia!! Hi there! Can I use non-silken tofu in this recipe? I prefer to use the block style, so could I add a bit of unswt almond milk or veggie broth to get the right consistency? Should the tofu and hummus mixture have a fairly thick texture? You might be able to, but it likely won’t get as creamy. But if you’re OK with that, it should work fine! WOW I really want to make this! Is it recommended to leave out humhums though? Or an substitute? I just made this. It is very rich, so no I didn’t miss the eggs!! Wish my oven was better, cos if I was able to get that hash brown base crusty it would have been so much better, cos the crusty bits on the side were awesome. Will probably try again. Oh, and there is no way the prep time is 15 minutes, 30 minutes more like, with all the hand grating for the potatoes I did! I made this for dinner tonight, subbing in a wholemeal pastry crust instead of the potato one ( I don’t have a problem with gluten). It was quite delicious and there will be some to freeze and some to take to work for tomorrow’s lunch! I would love to try this recipe, but with a sesame allergy in the house I can’t cook with hummus. Do you think just leaving it out would work? Or can you suggest a substitution? Sorry for the earlier response – didn’t see the sesame part! You could also just sub more silken tofu. Hii, this is wonderful I cant wait to make it! Do you think I can sub the potatoes for sweet potatoes, and the v butter for coconut oil?? :D excited to try this out! I do! Let me know how it goes! Oh my goodness, this was delicious! The only change I made was using real butter instead of vegan and using jarred sundried tomatoes instead of roasting my own. I am not vegan and I really think this is better than a quiche. They usually seem kind of dry and spongy to me. This, however, was deliciously creamy! I think I’m going to make the tofu/veggie sauce in a zoodle pasta bake- it seems like it would be delicious even like that! Thank you for another great recipe! You are definitely on my (short!) list of bloggers that I totally trust my taste buds to. Wonderful! thanks for sharing, Anna! Hello! This recipe looks awesome! I am trying to eat oil free. How would that work for the crust? Any sub for the margarine? Thanks! It should crisp up somewhat without the oil, but it definitely won’t be as crispy! Super yummy. Your tofu recipes really please, and amaze, my tastebuds. Next I’m gonna make your tofu stir fry. (Woohoo!) Well, this tofu quiche is simply amazing. I love it. Yumm this is excellent. I am a lay vegan with little talent for cooking and no fancy kitchen gizmos and found this easy and fun to make. Followed the recipe exactly, except that I didn’t make the crust, I used 1/2 a chopped onion rather than leeks, and used broccoli, mushrooms, and spinach for the vegetables. Roasted all except the spinach for 20 minutes at 375, then proceeded as directed. Mine’s a little crumbly which I believe is due to all the vegetables I stuffed in it but the taste and texture are amazing! I’m taking a long weekend trip this coming weekend with non-vegans and I think I will make this ahead of time to be my breakfasts! Thanks for the excellent recipe. Great! Thanks for sharing, Kate! What can you substitute if you do not have the nutritional yeast?? I don’t know anything about this yeast and wonder if it is simply for the taste? I am not a cook but this looks easy and I have almost all the ingredients. I notice that there is a link to sprouted wheat and wonder if a slice of sprouted ezekiel bread could be thrown into the processor. The nutritional yeast is used mainly to provide a cheesy flavor that is hard to come by in vegan dishes. It is also a source of B-12 and other vitamins which is why it’s called nutritional. B-12 is hard to get in vegan diets and usually has to be supplemented. You can usually find it in the health food section of your grocery store or a health food store. I’m not really sure of a good substitute. Perhaps a vegetable bouillon or maggi or smoke seasoning though these can be full of msg so you would probably be better off with the nutritional yeast. You could try a bit of marmite and grate some vegan cheese into the mix, maybe? I literally just got it out the oven and eating it as I’m commenting right now. It. is. SO. good. Beyond words. Its super duper creamy and the crust is perfect. I recommend following the hummus recipe to use in this quiche! Great question! It’s extra firm silken tofu. Still silken, just the firmer version. Hope that helps! I was hoping for a comment that addressed this! But I’m still confused. I am standing in front of the tofu case right now and all I see are silken, firm, and extra firm. There’s no “extra firm silken,” those are two opposite types of tofu as far as I’m aware. Going to try it with silken. I made this recipe using Blue Dragon extra firm silken tofu. It comes in a box that is the exact quantity for this recipe. Its long life, on the supermarket shelf not in the fridge. If you cant buy the extra firm version, i would suggest using the ordinary silken tofu. We tried this recipe today although a bit different because we had no silken tofu. We took different flavoured once and added vegetable broth to make it creamier. It tastes delicious. I changed this up to suit our taste and it was really out of this world good. I have never had quiche before so I can not compare to non-vegan. I used pie crust instead of the hashbrowns because I put potato in the mixture. I made the quiche base as instructed. I made two pies one pie I added cubed potatoes, onions, mushrooms,spinach and green chile. The other I just did potato, onion and green chile. I fried the potatoes and onions first I also sauteed the mushrooms and spinach. I have to say it is one of the best meals I have made. I have to add, we had this for dinner then the next day ate the leftovers for breakfast. I think it tasted even better the next day! This is an awesome recipe and can be changed up so easily. This will be a weekly stable now. So great! thanks for sharing, Tammie! This was so amazing!! Took a pic and will be posting on Instagram and tagging you!! Thank you so much for sharing your amazing recipes!! Seriously you have saved my household from so many food rutts!!! Tofu breakfast things are usually a hit or miss for me. This recipe, however, is definitely a hit. I think even non-vegans would love this quiche. Thank you so much for sharing easy, delicious vegan recipes! Looks amazing! I’m making this for brunch tomorrow….fingers crossed mine turns out so lovely. Yay! Let me know how it goes, Ell! 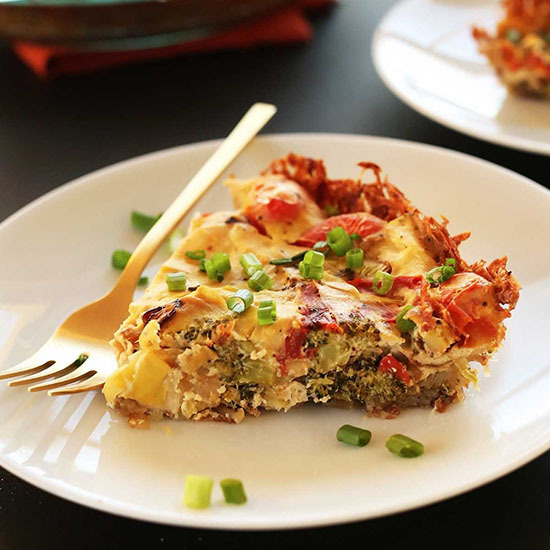 Brilliant healthy quiche option! Love the colors. Your recipes are all so inspiring! I find myself recommending your website to a lot of my clients, so thank you for being a creative genius! Thanks Danielle! Hope you enjoy this recipe! I cannot wait to try this. You are brilliant. Just made this tonight for myself, my husband and a friend. It was super easy to make and the first words out of my husband’s mouth when he took a bite were, “MMMMMmmm!! That’s really good!” You’ve done it again Dana! Thanks! MMMMM!! Looks delicious!! I will take some of that right now! ok I’ve made a tofu quiche before I think I might have done it wrong it was my least favorite dish…But I trust your recipe I haven’t made it but Im sure it taste great… (hipsters) ha, ha side joke. Hey Dana I hope you can check out my latest post it super minimal ‘ Herbed out Potatoes “, id appreciate it:)))oxox have a hippy day. I’ve been wanting to try my hand at making vegan quiche for a while now, but this recipe means I’ve got no excuse to put it off any longer! It looks delicious and I can’t wait to try it out. I’ll be sure to let you know how it turns out. Please, do! Let me know how it goes, Kathryn! This is brilliant. The filling sounds amazing–can’t wait to try it! This is so funny. I finally have to comment and tell you that I have been following your blog for a couple of months now and have been threatening to start my own V/GF blog for a year and a half. I’m building my recipe repertoire and every time I think of something new to add, you add it a couple days or weeks later. I made a super yummy quiche a couple weeks ago that was very different than this recipe and super tasty but a lot more work (I made my own random GF crust). I think I will try this out tonight and see which one I like better. Potato crust, good thinking! ha! I would argue there could always more tofu quiches in the world. Hope you start your blog! Mmmm I can’t wait to make this. I haven’t been terribly happy with some of the other vegan quiches/omelet recipes I’ve tried to make. I’m going to keep trying! Please let me know how it goes if you do, Sue Ann! all quiches should have hash brown crusts. I can’t wait to make this!! Hash brown crust?!!? Omg I’m so sold. Love all the veggies you packed in here and glad you’ve recovered from your bad tofu experience! Oh my! This is getting added to next week’s dinner menu. My child is going to go nuts over this recipe. Yay! Hope you all love it, Ashlee! Youuu are the only person who can make quiche look like $1,000 bucks! Dana, you are reading my mind! I was JUST searching for tofu breakfast recipes because my go-to tofu scramble is getting a little tired. This looks SO. GOOD. Do you think if I wanted to make this on Christmas morning I could bake the crust and prepare the rest of the quiche in the night before, put it in the fridge overnight, and toss it in the oven the next morning? Nice! Yes, this would be the perfect holiday breakfast. Hope you all love it! I think you could do something like that. Although I’d recommend baking the crust the night before and preparing the filling but not putting it in the crust til the morning. No need to refrigerate the crust, just the filling. Then bake as instructed. Hope that helps! I’m new to the tofu life and would love some tips on how to make a good tofu scramble! as you cook as it may burn. Just look at tofu as a meat alternative. YUM! This looks amazing! I will be making this. I am crushing on this HARD! I had a similar experience with my first tofu meal, only it was hoisin sauce, so I feel you. I love this idea and can’t wait to try!! Tofu + hoisin = potential troubles. Glad you recovered! Hope you love this recipe, Katrina!